I really enjoy dual time frame novels. I think it’s really clever how authors reveal parts of each story both in the past and the present. This dual time narrative was slightly different in that there wasn’t a big secret gradually being revealed. Instead the link is a hospital and a sense of mysticism. Grace Kemp arrives at a Brighton hospital in 1938 to begin nursing training, having been sent away by her family. Although it’s not confirmed till much later, the reader can guess what shame she has brought upon herself although not really the circumstances. About 80 years later, radiologist Mina, who works in the same hospital, is admitted there following a serious car crash. As well as having severe physical injuries, she also has a brain injury and is suffering from amnesia. We follow Grace through her nursing training and feel her exhaustion as well as her fear of matron and sister. We also follow Mina’s slow journey to recovery as very gradually her memory come back. I really enjoyed this book and was just as engrossed in both the women’s stories. Mina wasn’t as immediately likeable to me as Grace, seeming quite a spiky character always pushing people away and rejecting contact from her family. She is visited a lot by her boyfriend Mark while in hospital who is so keen to get her home but she senses something isn’t quite right. Even though she can’t remember much, she has a sense that what he tells her about their previous life isn’t right. As a reader we know exactly why that is but it takes Mina some time for her memory on this to come back and by then she could be in danger. What the reader doesn’t know is why Mina can’t contact her brother Geraint and I was really intrigued as to just why she wouldn’t get in touch with her aunt and uncle who had brought them up. Grace was someone I warmed to from the start. She was so lovely and worked so hard to make a success of her nursing. She was terrified of being ‘on the rug’ in front of matron and being sent home. I liked how she grew in confidence throughout the book, realising that some things which had happened to her weren’t her fault. And I could have cheered when one of the other nurses told her she was a natural at nursing. This was something clear to the reader, as Grace was such a caring individual, but Grace lacked the confidence to see it herself. 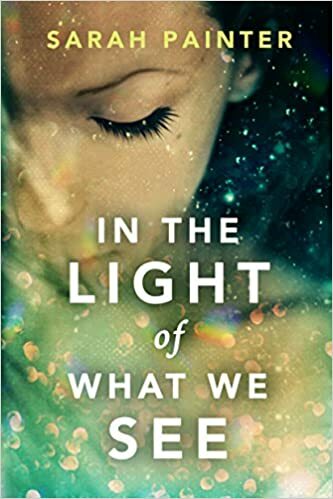 I was pleased by the end of the book to know how her life had turned out and thought the way the author included this in the story was quite clever bringing another connection between the women and the hospital. Another thing which connected both women was a psychic ability. Not seeing or predicting the future as such but having a sense of something going to happen. For Grace it was seeing a black shadow on someone, for Mina it was seeing ‘ghost-birds’. “I see ghost-birds when something bad is going to happen. They’re a warning. I don’t usually know what they’re warning about, although sometimes I guess.” Mina also sensed the spirit of a nurse while she is in hospital. I thought the way Sarah Painter weaved this sense of mysticism into her story was very well done. If you’re not someone who normally likes paranormal stories, I think you’ll find it’s not an intrusive part of the story but seems natural. In the Light of What We See was an absorbing story looking at both women’s lives. I haven’t read any of Sarah Painter’s other books but on the strength of this one, I will defnitely be on the look out for them. She certainly seems to have a knack for creating believable characters who I cared about and a story I was completely involved with. To finish, I must just mention that cover – how beautiful is that? I’m with you on the dual time-line books, when they are well-done they make for such rewarding reading. Thanks for this insightful review, Joanne. When a touch of the mystical is well handled it can bring a lot of depth to a book.